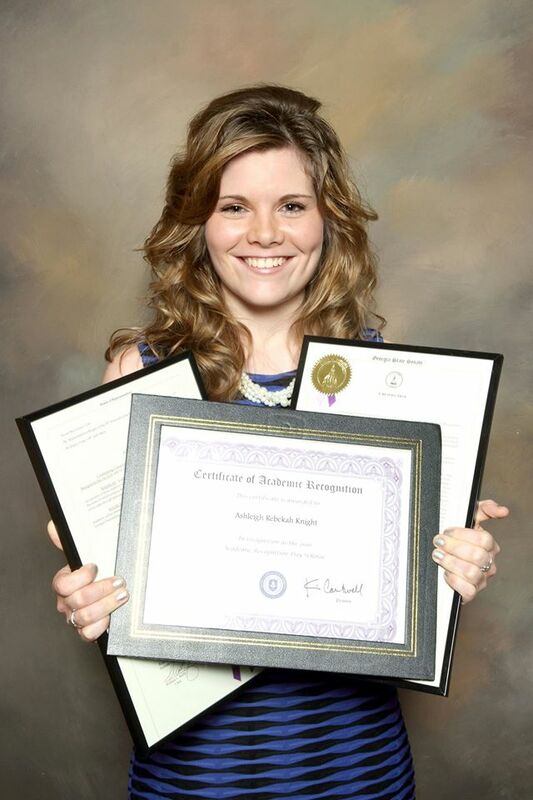 Ashleigh Knight, who will begin a teaching career in Houston County this fall, is MGA's 2016 Academic Recognition Day Scholar. Full Name: Ashleigh Rebekah Knight. band lead vocalist and class salutatorian. Employment: "I've been hired to teach in the Houston County School System after graduation." Degree Objective: Bachelor of science in Early Childhood/Special Education. Activities: Middle Georgia State 2016 Academic Recognition Day Scholar, Outstanding Academic Excellence Award for Macon School of Education Cohort, 2015 STEAM summer camp lead teacher, Future Georgia Educators Conference speaker/presenter. Career Goals: "My dream has always been to become an educator. Since I was a young child, I have felt the call to teach children. As I have grown older, that desire has grown into a love for children and a commitment to help each child become the best version of themselves. I have a heart of compassion for learning and seeing children grow socially, emotionally, and intellectually until they thrive. My goal is to not only teach academics, but to nurture the hearts and lives of each child that enters my classroom." area that I wanted to work in, which gave greater accessibility to a job opportunity. Going to college locally has allowed me to stay involved in my community and church where I’ve been able to serve as a Sunday School teacher, AWANA leader and choir and drama team member." begin my first year teaching." To her, “greatness” means … "Embracing who you are and using the talents you’ve been given while never being satisfied with where you are as a person. Greatness is being the best version of yourself while working to become the best version of yourself." Dysautonomia (which affects the autonomic nervous system) when I was 15, but through God’s grace, I am almost in remission from the condition at this time!" allow tragedy to keep her discouraged, but she used her tragedy to move on to greater things. compassion that her life exhibited." becoming a Teacher of the Year at my school!"